The buzz phrase at the In-gage office these days is the triple bottom line. It is a bit of a quirky phrase but it comes from our absolute passion to help organisations think of service as an investment rather than a cost. The triple bottom line theory is used in many research texts and put simply states; for a highly successful service organisation operations and improvements need to benefit the employee, business and customer. 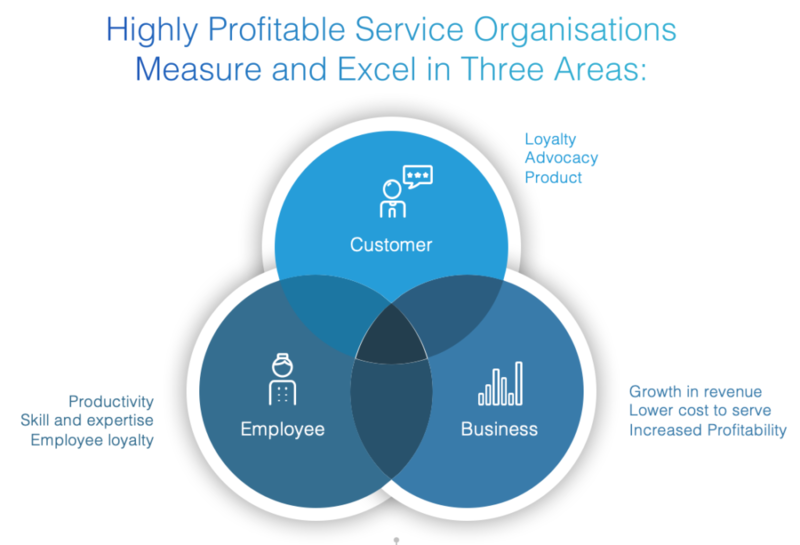 When companies look at service from these three areas, it builds a service organisation that is profitable for the company. Often times when we speak to customers about their service organisation we implore them to think about service beyond feedback forms, AHT (average handling time) and cases handled. For many companies, their contact centres or service desks are important for helping customers solve problems or answer questions, but it’s often hard to view service as revenue generating. At In-gage we believe that if you focus on the three areas of customer, employee and business you can create a service organisation that delivers outstanding quality, reduces customer churn and increases profit. “The customer is always right” is the old adage that has been the template for most successful service organisations and businesses. The wisdom is that a happy customer will always be a returning customer and an important advocate to your brand brining in new customers through word of mouth sales. We like to be pretty simple in our approach by asking/measuring that likelihood of recommendation and tying it back to the word of mouth acquisition. And secondly asking the likelihood of repeat purchasing/continued usage and tying this back to loyalty behaviours. Both have massive financial impacts on a company. In order to improve NPS scores companies need to ensure the consistency and quality of the interactions between the frontline staff and the customers. Understanding efficiency and metrics like first contact resolution rates or the effort a customer experience in solving problems with your company are also very valuable. The team at In-gage have developed our AI agent I-VIE. She is now able to bring rich insights from hundreds of thousands of customer comments and data points. The insights that we are able to provide allow service organisations to make targeted improvements and suggest new product or service offerings without manually trawling through masses of data. In order to develop great service company’s need to invest in their employees. Service organisations that wish to ensure consistency of service and high quality need to ensure employees are engaged, well trained and have the right tools to help customers. Our customers have found employee engagement is directly related to NPS, so happy employees means happy customers= ROI. This makes Employee engagement a key requirement for any service organisation to provide high quality customer service. We find that companies understand the need for employee engagement but struggle to find the tools to help increase employee engagement. The In-gage salesforce contact centre app gives companies the right tools for targeted training and coaching programs for employees. One of our customers was not only able to do this but has shown amazing results by acting on the data. GoHenry was able to increase NPS by 22% and profits by £500k after they installed our salesforce contact centre app in just 6 months. When companies place the customer, employee and business in focus they can create profitable and amazing service organisations.